The history of this company is a story full of entrepreneurial spirit and youthful exuberance that was America in the early years of the Industrial Age. The Wilkins Toy Company of Keene, New Hampshire manufactured a line of cast iron floor trains and toys from the late 1880's to 1919. Wilkins is known for making long slender, highly detailed locomotives, as well as coaches and freight cars with articulated trucks. The company was established by James Wilkins in 1890 when he purchased the Triumph Wringer Company, that made sewing machines and clothes wringers. Starting in 1885 and up until that time, Wilkins had worked for the company owner David Piper. Piper was also a local Keene resident who initially started his company in 1875. The Triumph Wringer Company had manufactured cast iron toys, including a toy wringer originally produced as a promotional item. The Wilkins 1890 cast iron train set was a groundbreaking product that opened many doors to the production of cast iron toys over the years. Founder James Wilkins had a true knack for building these cast iron toys, as they were very detailed for the time period and very popular among most children and adults. Sets were offered in both passenger and freight consists. The cast iron train set was the most successful toy that Wilkins created and sold. In addition to the train sets, fire engines were also an early product offering. Wilkins was not a very good businessman however, and by 1894 the company was in financial trouble. Wilkins was forced to sell the toy company to local Keene bike shop owner Harry T. Kingsbury and his grandfather, Edward Joslin. After the takeover, the company continued to blossom. The line was expanded beyond cast iron train sets to include cast iron toys such as carriages and farm machinery. 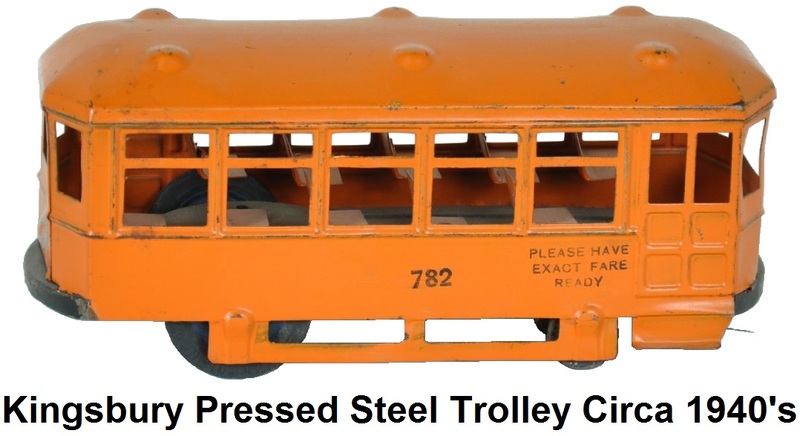 Over the next decades, Wilkins and Kingsbury manufactured numerous varieties of toys including cast iron toy trains, trolleys, trams, cars, cast iron toy banks, airplanes, fire engines, ships, and submarines. Harry Thayer Kingsbury was a young man filled with dreams. His inventive spirit took him from the ownership of a modest Keene bike shop to the boardroom of what would become one of New Hampshire's largest and most successful manufacturing companies. Along the way, this company overcame many of the challenges facing the country, including the Great Depression, natural disasters, and even two world wars. Harry was 25 years old when he became owner of Wilkin's. He had possessed an inventive streak and a gift for mechanical problem-solving. The new company created the perfect opportunity for the shy but inventive young man to blossom. Before long, young Harry had expanded the line of toys to include cast-iron carriages, farm machinery, and even the first toy horseless carriage in 1900. The early railroad cars were made of cast iron but as manufacturing processes became refined these products were eventually made out of sheet steel. A review of the early toys reveals H.T. 's commitment to detail. In 1902 he patented a clock-spring motor that propelled toy cars. Amazingly, the design of this early motor was so efficient it was used throughout the lifetime of the toy company. Harry's gift was not just his knack for designing new toys; he also designed and built the equipment that manufactured them. It isn't too hard to imagine H.T. tinkering in his workshop to find yet another way to produce more toys to delighted children everywhere - a practice he maintained almost until his death at age 91 in 1961. His patents were numerous and included battery- operated lighting systems for toy automobiles and a toy bank that recorded total deposits. When other toy manufacturers said it couldn't be done, H.T. delighted in doing it, and the quality and diversity of the Kingsbury toy line made the company an unqualified success. There were boats, cars, airplanes, trucks, submarines, and even blimps. Like the temper of the times, Kingsbury toys reflected America's fascination with motorized vehicles. The 1911 Wilkins catalog was 63 pages long and featured toy automobiles, fire engines, and horse drawn wagons, as well as, toy trams. In 1916, H.T. 's eldest son Edward received a new degree in Mechanical Engineering from M.I.T. and joined the company. He saw an immediate need for an automated drilling machine sensitive enough to drill through hard spots in the cast iron wheels of the toy cars without breaking the drills. Like his father, he enjoyed a challenge. His solution to this particular problem - the Friction Drive Drilling Machine - perfected in 1918, heralded the beginning of a new era for the company, which changed its name that year from the Wilkins Toy Company to the Kingsbury Manufacturing Company. That same year, the U.S. Government contracted Kingsbury to adapt their toy making machinery to produce a special wing nut for the country's fledgling Air Corps. It was the first, but not the last time, that our country would call on Kingsbury to assist with a war effort. The original machine used to produce the wing nut is now a part of the Smithsonian Institute's display of historic machines. In 1921, the first order for a Kingsbury drilling machine was received. In that same year, a young engineer named Gunnar Swahnberg was traveling to Keene by train to apply for a job at Kingsbury when he heard another man talking about the same position. When the train had barely reached the station, Gunnar leapt off and sprinted to Kingsbury to apply, hoping to beat the competition by more than a few footsteps. His gumption paid off. He was hired. Together, he and Edward would soon develop some of the most successful machining equipment in the company's history. He also rose to become President of Kingsbury years later. Under Edward's direction, the manufacture of drilling machines grew steadily, eventually requiring the construction of a separate building. In 1928, this part of the company was separated and set up with 50 employees and its own 15,000 square foot facility on a 17-acre site adjacent to the toy company. Edward was named President of the new Kingsbury Machine Tool Corporation. Harry and his younger son, Chester, continued to manufacture remarkably detailed toys that slowly took on the full personality of the items they were meant to resemble. The toy cars had electric head and tail lights and even Swiss music box radios. However, the catalog began to shrink. The 1925 Kingsbury catalog contained only 20 pages. In the 1930's, Chrysler Airflow cars were extremely popular. Recognizing this, H.T. and Chester introduced a different Chrysler toy automobile each year, replicating the yearly styling changes so closely that Kingsbury toys were the only ones licensed to display the Body by Fisher emblem. An early advertisement in The Child's Magazine promoted Kingsbury toys as "so life-like they seem turned small by magic." The decade of the 1930s proved difficult in many ways. As the country's Depression deepened, Kingsbury struggled to hold on. In 1936, a devastating Keene flood stopped production, triggering a decision to expand to meet a growing demand. Two years later, a hurricane and flood again shut the plant down for a week. But by 1939, clouds of war loomed over the land, and Kingsbury was once again called on to aid in the buildup of the U.S. military forces. As a result, the machine tool business experienced rapid growth. however, the war had an effect that the Depression, floods, and even a hurricane were unable to have: it closed the toy manufacturing business forever. The need for steel and rubber for the war effort relegated metal toys to a low priority status. By 1942, the toy manufacturing area had been taken over for the production of machinery. The company never looked back. Two years later all the equipment used in the production of toys was sold to Keystone Manufacturing Company of Boston which produced toys for a few short years afterward. Kingsbury is still in business today as a tool and die maker. Today, the Wilkins 1890 cast iron floor train set is an extremely popular toy among many vintage collectors. These sets can go for a good deal of money, depending on the particular model and the quantity that was originally made. Because Wilkins made this generic cast iron train set as a base model to venture into different models and sets that were unique in their own way, there are several combinations and variants in existence. Many replicas have also been made over the years. The original train sets made by James Wilkins in the early 1890's are the only highly desirable cast iron vintage toys that carry a hefty price tag.